This year has been surprisingly exciting, despite the fact that half of it was swallowed up by the lockout. To be honest, I was fully prepared not to have a 2012-2013 season. When negotiations finally went somewhere and the season was announced to start, my father decided to boycott this season—there would be no purchasing of anything related to the NHL. I was all for this in the beginning, angry and not expecting much to come from the season anyway. Then a breath of fresh air came to Southern California and its name is Viktor Fasth. As any Duck’s fan knows, the team’s goal tenders have been a hit and miss for at least the last decade. There have been great seasons that implode with dissatisfactory games—do I have to remind you of the 2003 Stanley Cup finals? No, I didn’t think so. When Jonas Hiller came onto the scene, I thought we had been saved. 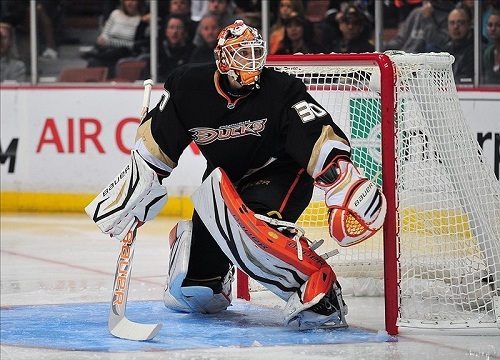 He was amazing compared to Ilya Bryzgolav, whose last season with Anaheim was full of sad sighs. Then that damn vertigo came along and ruined everything for us. It took him a year to come back, but he was not the same—the symptoms he had been battling were clearly still present, but he was too stubborn to admit it. That is my biggest problem with Hiller; he is as stubborn as a mule and beats himself up over the smallest of mistakes. Coming into the 2013 season, we were all interested to see just what was so special about a thirty year old rookie goal tender from the European leagues. I specifically remember hearing the announcement of Viktor Fasth coming to the Anaheim Ducks and sighing, exasperated. “I really hope they know something we don’t…” I mumbled. Obviously, they did. We played the Nashville Predators on his NHL debut—he blocked nineteen out of twenty-one shots on goal that night and helped us to a victory. He won each of his first eight games, falling just short of Ray Emery’s rookie streak in the 2003-2004 season. The sudden realization of the magnitude that is Fasth seemed to cause Jonas Hiller to really pay attention to the fact that if he didn’t produce, he would have to hand his starting spot to the rookie. The two were constantly working harder and harder than before, helping the Duck’s to produce their best season since they won the cup in 2007. Fasth is currently ranked fourth in shutout games and fifth in both save percentages and goals against average in the entire NHL. Our goal tending has been razor sharp this year and it all started with a one year deal with a man whose talent and determination never could have been imagined in our wildest dreams. If all is said and done this year, at least I can say with confidence that we had some of the best net-minding skills in the league.